Epson Workforce WF-7515 is a true A3+ all-in-one printer designed for small businesses and home offices. It offers enhanced connectivity and greater productivity with its high-end features like Wi-Fi, 30-sheets ADF, memory card slots, PictBridge and 250-sheets paper tray. It delivers professional quality photo prints with the help of its high-yield Epson Workforce WF-7515 ink cartridges. This printer weighs approximately 15.6 kgs and measures 559‎ x 418 x 287 mm. It is capable of saving up to 50 percent on cost per page compared to other all-in-one inkjet printers. It efficiently prints 34 pages per minute in draft mode, and up to 15 mono and 8.4 colour pages per minute. It boasts direct printing options and supports Apple AirPrint and Google Cloud Print. This multifunctional printer is ideal for users such as graphic designers, architects, and engineers. Its time-saving features and functionality make it a perfect blend of performance and convenience. However, it is comparatively slow for A3 and A3+ printing. 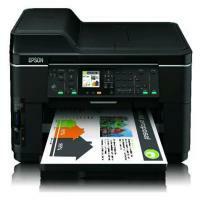 Epson Workforce WF-7515 is a multifunctional printer that offers some really great features. It is capable of producing high-quality photo prints with the help of its quality ink cartridges. This printer is ideal for graphic designers, architects, and engineers. Q. If I buy a multipack of Epson Workforce WF-7515 ink cartridges, can I select colours specific to my needs? Will that cost more than purchasing what’s already offered? A. Yes, certainly. You can let us know what colours you need by mentioning it in the column we have on our page. And you do not have to pay extra if you choose the colours you want. Q. How many months’ guarantee do you give on Epson Workforce WF-7515 ink cartridges (Epson T1295)? A. We give a guarantee of one year on these Epson ink cartridges. Q. Does cleaning the print head of Epson Workforce WF-7515 ink cartridges to fix poor quality printing use ink in them? What if there’s no ink in the cartridges at the time of cleaning them? A. Yes, print head cleaning will consume some amount of ink present in the cartridges. It depends upon the number of print head cleaning you perform. If the amount of ink is low or if there isn’t any ink in it, the process will not take place. Q. Are extra high capacity Epson Workforce WF-7515 ink cartridges available in a pack of 8? How many pages will black cartridges print? Do they print more than colour cartridges do? A. Yes, extra high capacity (XXL) Epson Workforce WF-7515 ink cartridges are available in a pack of 8 for you. The black cartridges in this set print up to 945 pages, which is more than what colour cartridges print (755 pages). Q. If I have an urgent requirement of inks for my Epson Workforce WF-7515 printer, can you deliver its cartridges within two days? A. Yes, we execute 1-2 days delivery of items. You just need to place your order before 12.00 noon for that, and if all the factors like transportation and stock availability are favourable, we can deliver the items within two days. Q. I’d like to know if compatible Epson Workforce WF-7515 ink cartridges are provided the same efficient and quality services as genuine cartridges, I’d also like to know if the delivery of compatible ink cartridges is as quick as that of the genuine ones. A. Yes, compatible cartridges, including Epson’s Workforce WF-7515 ink cartridges, entitle you to competitive services and deals that include quick and minimum delivery charges. Q. Do Epson Workforce WF-7515 ink cartridges come chipped? A. Yes, the makers of these ink cartridges have ensured that even the compatible ones are fully chipped. Q. I’m interested in buying a multipack of Epson Workforce WF-7515 ink cartridges for my department which is really big. However, I’d like more of black cartridges as we use them more. Do you provide that option and how do I go about it if you do? A. You can buy a multipack of 20 ink cartridges of different colours. You can also buy more number of cartridges of the colour you want specifically; all you have to do is click on the ‘more details’ tab and mention the colours you need, and you’ll get them delivered promptly. Q. Do Epson Workforce WF-7515 ink cartridges have good ink volumes? Do they contain more ink than genuine cartridges’ do? A. Yes, these cartridges, contain excellent ink volume, which is more than what you’ll find in genuine ink cartridges, so you can print extensively with them and simultaneously save more. Q. I’d like to know if the quality of output one gets by using compatible ink cartridges (Epson Workforce WF-7515 ink cartridges) is better than for original ink cartridges. A. These ink cartridges also print high-quality text and images just like original ink cartridges do; and the fact that compatible cartridges help you save more while giving the same results gives them an edge over original ones. Q. In case I need to return the Epson Workforce WF-7515 ink cartridges, will it get me the entire amount? Q. Been thinking about using compatible toner cartridges as the genuine ones that I’ve used are turning out to be quite expensive. A. Compatible ink cartridges also provide the same services, experience and satisfaction that genuine cartridges do, besides more savings. They are delivered promptly and also entitle you to the same support that genuine ink cartridges have.